Just their luck. It was raining. And windy. But the truth is they didn’t mind so much. One after another, the nine women climbed gingerly onto the Boston police boat as it idled at the dock on Long Wharf. A week before, they had been unceremoniously removed from Long Island, where they and some 20 other women were living in a place called Joelyn’s House. 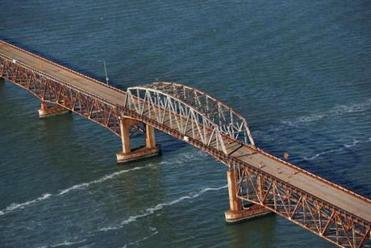 The bridge linking Long Island to the mainland was deemed unsafe. The cops told everybody they had to leave, now. Now, a week after the chaos, a cop was guiding a boat carrying those same women through choppy waters, across Boston Harbor, toward a deserted island where the women of Joelyn’s House had left everything they had. Vicky Ruvido’s 29-year-old daughter, 114 days into her recovery, was off the island, parked in a van at the Red Line station in North Quincy, waiting to pick up the women from Joelyn’s House who were coming back from work when the evacuation order came down. Boston Mayor Marty Walsh announced Wednesday that the overpass would be shut down after inspectors deemed it unsafe. Ruvido’s daughter and some of the other women ended up at the Shattuck hospital for the first night. Some others ended up in a motel in Randolph, which wasn’t the optimum place to put a bunch of vulnerable addicts. Temptation in the form of a small plastic bag was around the corner, and one of the women picked it up. They had to throw her out of the program. The only thing the women of Joelyn’s House took off the island with them was their sobriety, and the disruption, the tumult of the evacuation, the uncertainty they suddenly faced, sent some of them looking for comfort in the bad old places. Still, almost all of them stayed clean, stayed focused, stayed the course. Vicky Ruvido’s daughter had a court date the morning after the evacuation. She showed up in her pajamas, because that’s all she had to wear. “Thank God, the judge was a good person. Very understanding,” Vicky Ruvido said. The one thing her daughter wanted most to retrieve from the island was a notebook, a journal she has kept since she began the odyssey of recovery. It is testimony, as important as any 12-step meeting, as any chart or medical notation, a record of a woman reclaiming her life. It is a fluid, unfinished, maybe unfinishable narrative of one woman’s recovery. Writing the chapter of the forced dislocation from Long Island will take some time. At this point, it’s too soon to assess whether it is a turning point in either direction. But she is saying all the right things, and she is as positive as possible, given the circumstances. Now her daughter, living in a house in Dorchester, has had to start that process all over again. And then the police boat turned up, idling at Long Wharf. More than 500 of the most vulnerable people in and around the city — the homeless, the addicted, ex-cons — were affected by the forced evacuation of Long Island. There are all sorts of machinations going on right now, trying to create more stable and suitable locations for these people. All this as, despite the Indian summer of last week, winter approaches inexorably. Vicky Ruvido, for one, believes that if there is a silver lining to the shuttering of Long Island it’s that the inherent challenge in how a society takes care of its most vulnerable citizens is now in the open, as is the responsibility to address it.